Award-winning Master Sommelier McClintic, star of SOMM, the acclaimed film that debuted in 2013, will present Level I and Level II Master Sommelier Courses and Examination at the stunning Bacara Resort and Spa in Santa Barbara with three of his Master Sommelier colleagues. This curriculum is highly sought-after and several sessions throughout the United States have sold out. This is the second year that McClintic is co-hosting the Master Sommelier courses and examination in Santa Barbara, the heart of Central Coast winemaking. 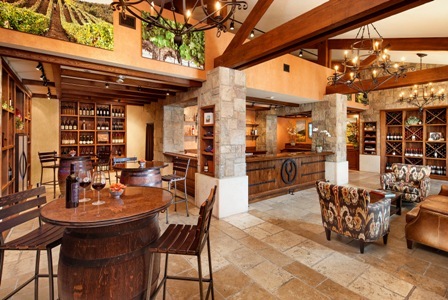 Featuring a 12,000-bottle Wine Cellar (awarded Wine Spectator’s Best Of Award of Excellence) and an onsite Foley Wine Tasting Room, Bacara has established itself as the premier Santa Barbara resort destination for wine aficionados. 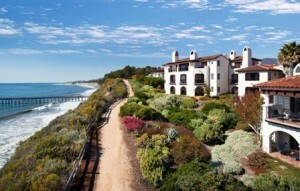 Embodying the essence of the American Riviera lifestyle, Bacara is nestled on the bluff and beaches of the Gaviota coast, just 40 miles from the famed Santa Ynez Wine Country and five miles from the Santa Barbara Airport. 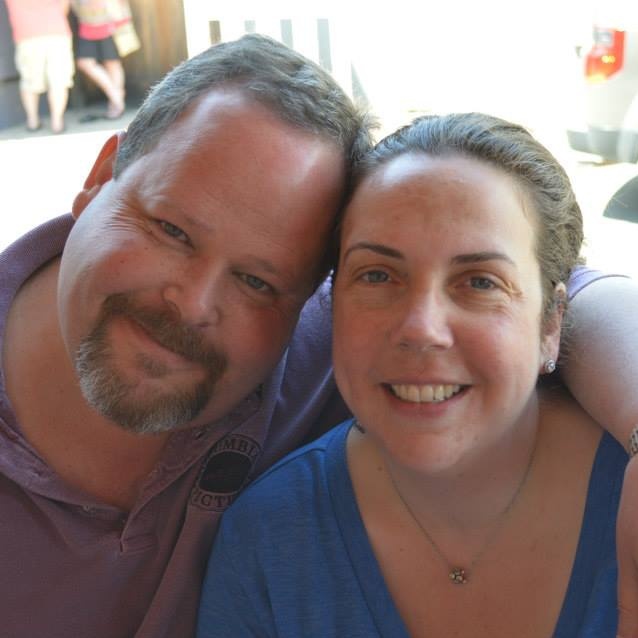 Brian brings 15 years of hospitality experience with him to Les Marchands Wine Bar & Merchant, a career spanning the major restaurant hubs of Los Angeles, Aspen, San Francisco, and now Santa Barbara. McClintic was one of four subjects featured in the acclaimed documentary SOMM, which chronicled his journey to the elusive Master Sommelier title, becoming the 107th individual in the U.S. to attain this honor. SOMM, distributed by Samuel Goldwyn Films, opened in 2013, receiving rave reviews by the public and film critics. In addition to Les Marchands, Brian, and business partner Eric Railsback, have teamed up on a Santa Barbara Syrah project called Vallin, along with local winemaker Justin Willett and fellow Master Sommelier Dustin Wilson. In its inaugural year, McClintic was named as “The Wine Guy to Hire” by Departures magazine and awarded “40 Under 40 of America’s Tastemakers by Wine Enthusiast in 2014. Reggie Narito is one of only 219 people in the world and one of only three Filipino Americans to hold the prestigious title of Master Sommelier. A native of Alameda, California, Reggie began his career in the restaurant industry at the age of 17 and has worked in noted Bay Area restaurants such as Star’s in San Francisco, Le Papillion in San Jose and the Plumed Horse in Saratoga. He has consulted in the design of numerous beverage programs throughout the Bay Area. He is currently employed with the Estates Group, the Fine Wine division for Young’s Market Company, working as the VP of Fine Wine in California. He also appears in the recently released movie SOMM. He resides in San Jose with his wife Kim and their three children. Jason Heller became involved in wine professionally in late 2005 while living in Hawaii. After moving to Napa Valley in 2008, he first ran the beverage program for Thomas Keller’s Michelin 1 Star Bouchon Bistro in Yountville before moving down the street to become Wine Director at Redd, also a Michelin 1 Star. A move onto the winery side of the business led to a position as Director of Education for Harlan Estate, BOND Estate and Promontory wineries. He was awarded first place at the National Chaine des Rotisseurs Young Sommelier National Finals competition in 2009 and Wine and Spirits magazine named Jason a “Best New Sommelier” in 2009. In 2010 he placed 1st overall in the inaugural national TOP|SOMM competition as “Best New Sommelier”. In 2011 Jason passed the rigorous Master Sommelier exam and is currently the National Sales Manager for DANA Estates winery in Rutherford, California. Jay Fletcher is the Executive Director of Fine Wine for Southern Wine and Spirits of Colorado. Fletcher is an accredited Bordeaux Educator from the L’Ecole du Vin in Bordeaux, as well as being a Commandeur d’Honneur from the Commanderie du Bontemps of the Medoc, Graves, Sauternes and Barsac. 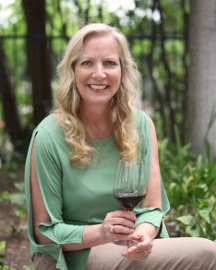 Jay is Chairman Emeritus for the board of directors of the Court of Master Sommeliers Americas and serves as a Master Level examiner for the organization. Fletcher has worked his way through all aspects of the restaurant and wine industry over the last forty years. He has solid experiential knowledge of the operation and management systems needed to run successful restaurants, wine programs, and wholesale beverage operations. In 1996 Jay passed the prestigious Master Sommelier Exam in London, England, to become the 30th American to hold the title of Master Sommelier. Fletcher travels around the country as a guest speaker and educator at hundreds of wine events and is one of the founding members of the Guild of Sommeliers Education Foundation as well as the Cellar Master for their extensive wine collection. During his term as Chairman of the Court of Master Sommeliers, Jay was involved in the production of the cult sommelier movie SOMM and was featured in the film. The title of Master Sommelier is reserved for individuals who successfully complete all four levels of the Court of Master Sommeliers’ educational program. The Master Sommelier distinction is the only internationally recognized credential for individuals in the beverage sales and service fields. Nestled on the bluff and beaches of the Gaviota coast between the Pacific Ocean and Santa Ynez Mountains, Bacara offers relaxed luxury and incomparable natural beauty. The resort features 360 lavish guestrooms and suites, each with a private balcony overlooking breathtaking views of the Pacific Ocean or flower-filled gardens. Additional features include a four-story spa, a state-of-the-art wellness center, three zero-edge saline swimming pools, four restaurants and lounges, a 12,000-bottle Wine Cellar & Tasting Room and direct access to Santa Barbara’s beautiful wine country. Steve and Amy have built a home for their two children in the hills of Valencia. Lured by the schools; they packed up their belongings in West LA and embraced Santa Clarita living. The house they chose had one fault: a patio door with a view right into their neighbor’s dining room. Instead of looking 30 feet into their neighbor’s home, Amy thought the small alcove created by the enclosed patio space was the perfect size to build a wine cellar for Steve’s growing collection. But before we put on a sweater to pass through the glass doors of the custom-built temperature-controlled cellar; we linger for a moment in the large sunny kitchen. Amy has set out a few pairing foods including cheese, crackers, deli meats and nuts while Steve, though unasked but his guests were thrilled nonetheless, had also laid out a couple of…items. “I’ve learned to base my wine collecting choices on several factors. There was a time when I would chase high scoring wines and I would open them and they would not appeal to me. I am looking for quality wines that are not necessarily available at a local wine shop. 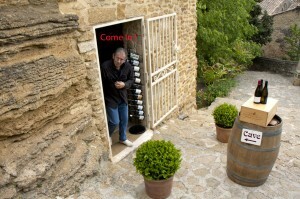 With the Corra, I was following a winemaker I respect. 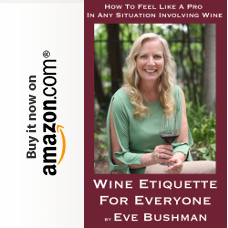 Over the years, she has made wines for Staglin, DR Stephens, Cornerstone, Hollywood & Vine, and Keever, which I poured at the wine classic and people really loved. But it was the Scarecrow that really put Celia on the map,” Steve said. Other California winemakers that Elzer follows and collects include: Manfred Krankl from Sine Qua Non, Marc Aubert (Aubert, Bryant Family), Bob Levy (Harlan), Martha McClellan (Sloan), and Helen Turley (Marcassin) among others. “I like to follow winemakers or great wine estates, but other ways to follow wine trends that I use are the online discussion groups on wine web sites like the (Robert) Parker Board, (http://www.erobertparker.com/info/boardintro.asp) wineberserkers.com, and West Coast Wine Network. I also will pay close attention to what producers are using fruit from vineyards I love, and sometimes I even follow the vineyard managers. There are people like David Abreu who are meticulous at farming and getting the best out of what the land can offer. I also like controversial winemakers who are making challenging wines: guys like Abe Schoener at Scholium Project. I poured one of his wines at the Classic and a lot of people really liked what he was doing with the wine,” said Elzer. Not too much distraction for us – as Steve then opened a 2000 Chateau Monbousquet Grand Cru Bordeaux. A nice segue from our Corra California Cabernet, with the expected older nose and perfect mouthfeel, we were thrilled with the lingering flavors of all that our day had brought. I didn’t bring a notepad into the cellar. I wedged myself in there only to see every wine I’ve ever loved, and, every wine we’ve ever heard about. A lovely room, with wine racked on 3 walls, some still nestled in their wooden boxes in every corner, splits stacked up against a mirrored wall…we were in awe. I found myself patting each with my hand as I recognized old friends and sought out new ones: Sine Qua Non, Lafite Rothschild, Chateau Latour, Ausone, Colgin, Pride Cabernet, Joseph Phelps Insignia, Robert Mondavi, Harlan, Screaming Eagle, Dalla Valle Maya, Peter Michael, Switchback Ridge, Chateau Y’quem, Lynch Bages, Angelus, Pinchon Longueville, Gaja, and Sassicaia,, to name a few. Steve says “these are not trophies to me: they are meant to be opened and shared.” For everyday drinking pleasure, he will pop a cork on go-to labels like Kuleto, Beringer, Kosta Browne, Seasmoke, or a Bordeaux like Goulee. 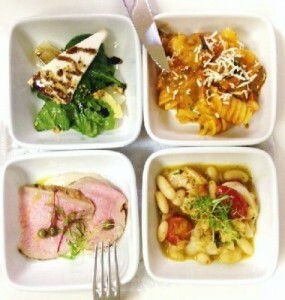 Piero Selvaggio, VALENTINO and Executive Chef Nico Chessa proudly present “Il Quadrifoglio,” a stunningItalian-styled bento box of four seasonal dishes for $25. The quartet of dishes changes nightly and is designed for both its visual and flavor balance. Valentino is renowned for its use of exceptional Italian products which are showcased in the menus: specially selected Colatura di Alici, 24 Months Aged Prosciutto di Parma, Cerignola Olives and Bottarga, among others. Sample menus includes Thursday’s “Il Quadrifoglio” of Apulian Salad with Tomato and Burrata Cheese, Mushroom Tortino Parmesan Saffron Fonduta, Potato Gnocchi Basil Pesto and Pecorino; Rabbit Cacciatore and Mashed Potatoes or Saturday’s featured platter of Crudita di Mare e Colatura di Alici, Fried Bufalo Mozzarella Garlic Marinara; Lasagna, Mushroom and Duck Ragù, Fried Bufalo Mozzeralla Garlic Marinara. Selections from Piero Selvaggio’s legendary wine cellar and Valentino’s extraordinary desserts may be ordered separately. 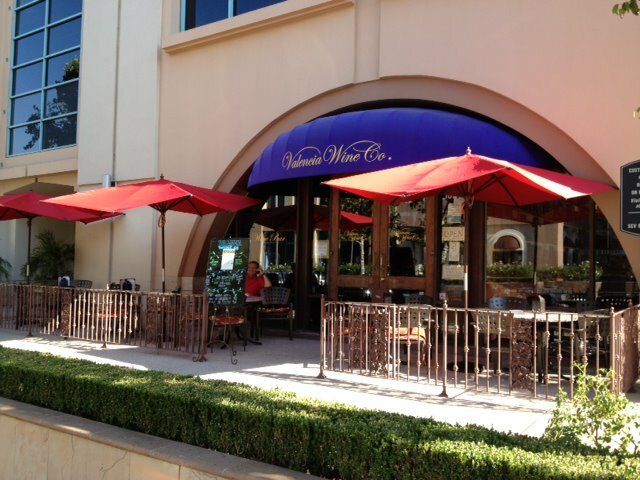 Availability for the Vin Bar at Valentino is on a first come basis and does not require reservations. For the past 41 years VALENTINO has retained the title as leader of Italian fine dining in Los Angeles. Piero Selvaggio and Executive Chef Nico Chessa are passionately developing new menus of innovative dishes that break away from the past traditions, leaning to the modern, all designed with an elegant fresh look and composition to be discovered by the next generation of guests discovering VALENTINO, the quintessential Italian restaurant of Los Angeles. Piero Selvaggio and VALENTINO have made a significant contribution to the Los Angeles restaurant scene for over forty years, introducing authentic Italian products, wine and regional cuisine to the public and nurturing many of our most influential chefs and restaurateurs. Selvaggio was recently recognized for his achievement in Angeleno and Wine Spectator magazines in October 2012. VALENTINO was named among the best Italian restaurants in the United States by Travel & Leisure and The Daily Meal. 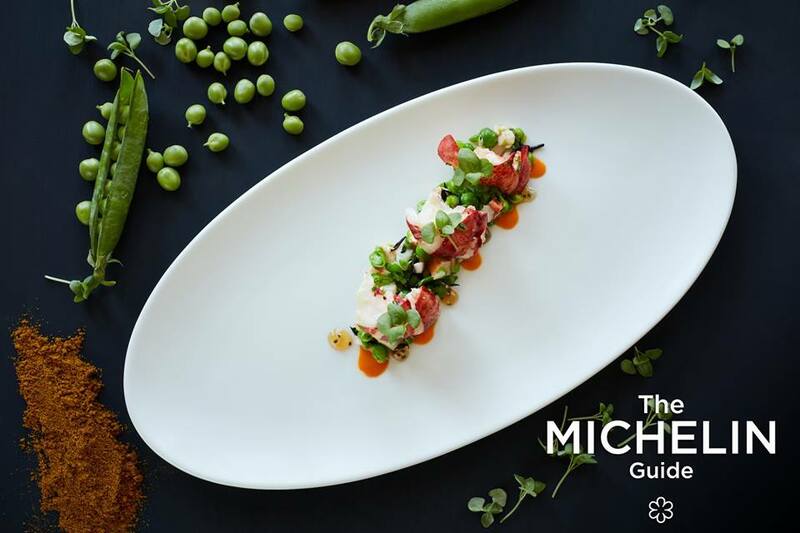 The restaurant was named among the thirteen restaurants that changed the Los Angeles dining scene by Zagat.com in 2012 and awarded Top 10 Romantic Restaurants, Top 10 Wine Lists, Top 10 Italian Restaurants in Los Angeles by Gayot.com in 2012. In 2013 Piero Selvaggio was one of five recipients of the prestigious Grana Padano Italian Cuisine Worldwide Awards and was also profiled for the “Lifer” interview in Eater LA about his legendary career the same year. With its intimate dining rooms, unsurpassed wine cellar, and the consummate graciousness of owner Piero Selvaggio, VALENTINO remains the favored destination for some of the best dining in Los Angeles. As reported in “Part I–Burgundy,” Don and I traveled to Southern France this spring, combining an 8-day river cruise of the Saone and Rhone rivers with a week-long, independent driving trip along the French Riviera. As our trip progressed, we left the Saone and Burgundy behind, and the Viking Europe, carrying 150 passengers, merged onto the Rhone and took us to the destination port of Tournon. 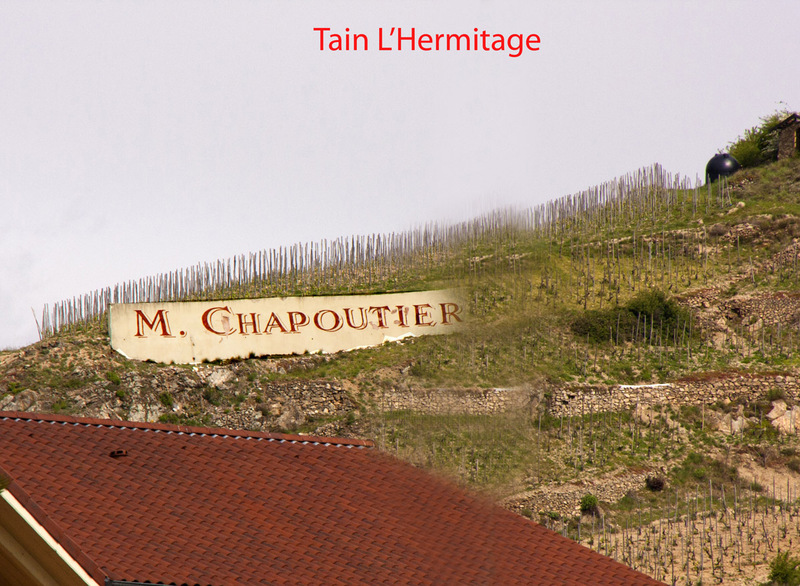 On the river bank across the Rhone from Tournon, the famous vineyards of the Tain L’Hermitage beckoned us. We had cruised about 140 miles in a southerly direction since we left the Burgundy region, and we looked forward to warmer, sunnier days. In this northern region of the Rhone, the river is bordered by steeply-sloping vineyards on terraced hillsides. This is the home of the red Syrah grape and, and in lesser amounts, the white Viognier, Marsanne, and Roussanne grapes. 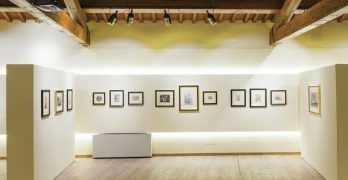 Our included morning excursion would take us first to the world-famous Valrhona chocolate factory, then to a small museum housing a collection of paintings from the “New School of Paris,” and finally to visit a winery in the Crozes-Hermitage appellation. Although the focus of my report is “wine,” I would be remiss if I did not digress and tell you a little about the chocolate, which, of course, pairs so well with the red wine of the Rhone. Don’t hesitate to strike the tour of the Ethel M Chocolate Factory in Las Vegas from your bucket list and go straight to the Valrhona Chocolate Shop in Tain L’Hermitage! Words can not do justice to the experience, and I’m too embarrassed to publish photos of my gauche (a word I use only in France) comportment. Suffice it to say that Valrhona is perhaps the finest chocolate in the world. The visit involved no tour, talk, or demonstration; it simply provided one the opportunity to eat as many of the hundreds of samples of chocolate as one could consume within a roughly 15-minute period. And….that’s all I am going to say on the matter. As we made our way to the Domaine du Murinais Winery, we passed by numerous steeply-terraced and rocky vineyards in the Hermitage and Crozes-Hermitage appellations. The vines here were noticeably leafier this time of year than those of the cooler Burgundy region. From time-to-time, we would see, propped against the stone retaining wall of a vineyard, a giant “billboard” advertising the name of a famous negociant. 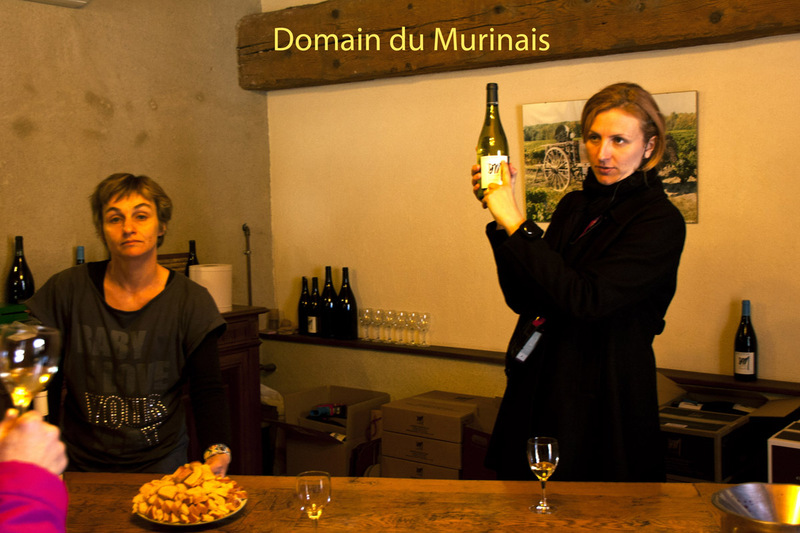 The visit to Domaine du Murinais included a brief tour of the pristine and modern winery operation, a close-up view of the vineyard and its 40-year-old Syrah vines, and a vertical tasting of three wines. The wines were typical of the Northern Rhone–predominantly Syrah, mixed with a small amount of Marsanne or Roussanne to lighten the blend. The 2007 vintage was elegant, round, and smooth, but the 2009 and 2010 were still young. All three vintages were ruby red and had fruit and floral notes with a hint of spice. 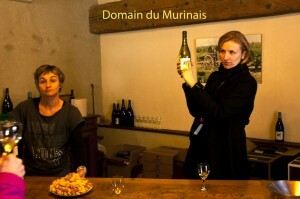 The price range was from 15-18 Euros per bottle and quite a good value, in my estimation. I have since read that the wines of the Crozes-Hermitage are often as good as the crus of the Hermitage and are considerably more affordable. The final port, where we spent the last full day of our river cruise, was the charming medieval city of Avignon. 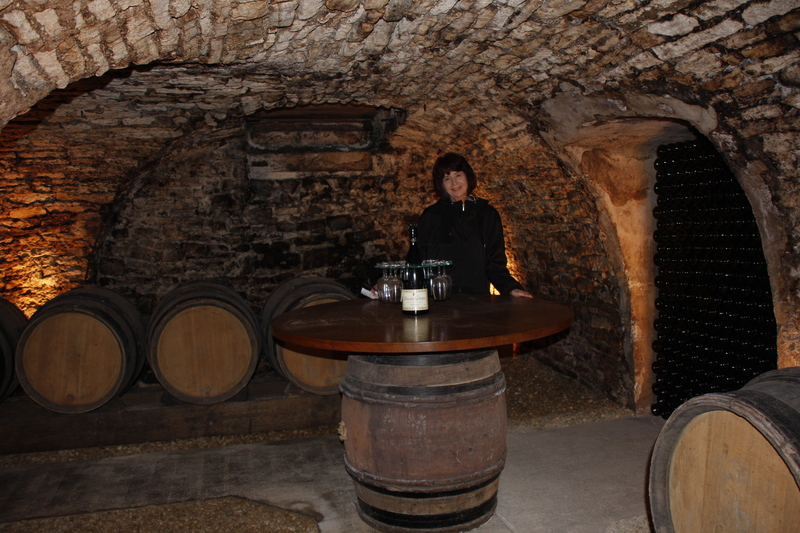 We were now about 60 miles south of the vineyards of the Northern Rhone, and the temperatures were warmer yet. This region of the Southern Rhone is considered part of Provence and has a Mediterranean climate. Our included morning excursion was a walking tour of Le Palais des Papes (Palace of the Popes), the largest Gothic palace in Europe and home of the papal seat when it was temporarily relocated to Avignon in the early 14th century. The Palace of the Popes is a must-see museum and World Heritage Site, and as one exits through the gift shop, the relationship between the popes of Avignon and wine becomes readily apparent. The bottles of fine wine for sale far outnumber the souvenir trinkets! As the story goes, the popes of Avignon were avid viticulturists, and they loved their wine. But the land around Avignon was not fertile enough to grow superior grapes. So one of the popes built a new castle upriver and established vineyards in a more advantageous region for cultivating grapes. And this, my fellow wine enthusiasts, is a brief account of how we have come to lust after the wines of the Chateauneuf-du-Pape. Viking offered the excursion to Chateauneuf-du-Pape as as an optional tour for which one had to pay an additional $50 per person. Actually, this was fine by us because it made for a smaller group and one that tended to be more serious about wine. On our short bus ride from our dock in Avignon to the Skalli Winery in Chateauneuf-du-Pape, we were able to get viable views of the vineyards along the the roadsides, and we even made a couple of photo stops. 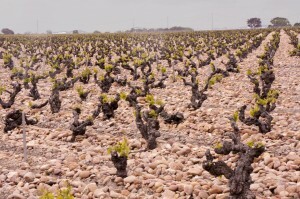 The vineyards in this Southern Rhone region are planted on flat flood-plains consisting of clay and sandy soils. 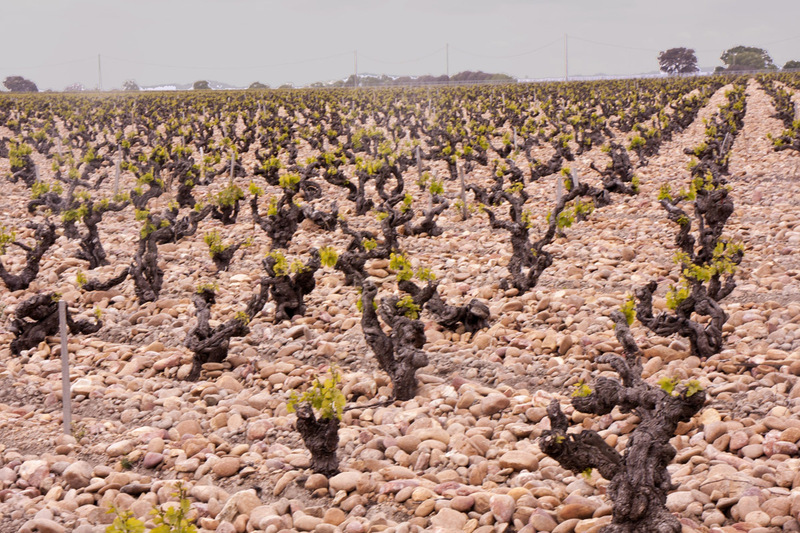 However, the vineyards are completely covered with large, smooth river rocks that retain the heat of the day and reflect it back onto the vines at night. This is a white blend of Bourboulenec, Clairette, Roussanne, and Grenache Blanc. This is not an AOC wine, because Grenache Blanc is not one of the permitted varietals for a wine to be called a Chateauneuf-du-Pape. It is light, aromatic, and quite drinkable. This is a red blend of Grenache, Syrah, Mourvedre, Cinsault, and Terret Noir. Flavors of red fruit and spice; a wine for long cellaring. The grapes for this red come from 75-year-old vines, and the blend is 90% Grenache and 10% Syrah. Full bodied; red fruit and spice; ripe tannins; complex, but balanced. The second part of this optional afternoon excursion was to visit the small village of Chateauneuf-du-Pape. The first stop was the hilltop above the village where the ruins of the “new castle” remain. Just as our bus was pulling up to the site, dark clouds appeared overhead, and it suddenly began to rain. Our guide said that she would be more than willing to continue with her usual practice of conducting a walking tour down the hillside and into the village below. However, anyone who wanted to stay on the bus could ride down to the village when the bus relocated to pick up the hikers. While most people stayed on the bus, Don and I and three or four others weren’t about to let a little rain limit our experience. But when my umbrella turned inside out, and I was sure that a mistral was upon us, I ran back to the bus, while my intrepid husband covered his camera with his raincoat and forged ahead. After a short while, the bus driver drove down to the village and parked along a main street. Soon the rain let up, so a few of us decided to explore the town. I peered down into ancient cellars and poked my head into tasting rooms as I strolled along the cobblestone streets. I purchased the perfect souvenir of our trip–a jacquard tablecloth with the names of famous French chateaux woven into it. When I was leaving the linen shop, I ran into Don, who was ambling down the hill and looking like a man who had just been on a religious pilgrimage. He said that, as he and the hardy hikers trooped down the hill, a local wine merchant appeared in his doorway and offered them refuge from the rain. 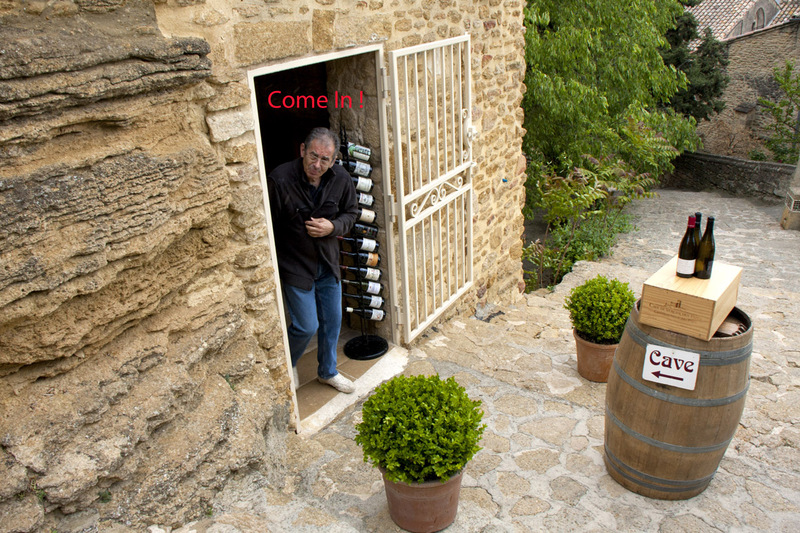 He invited them into his cave and treated them to a complimentary tasting of some world-class Chateauneuf-du-Pape wines. 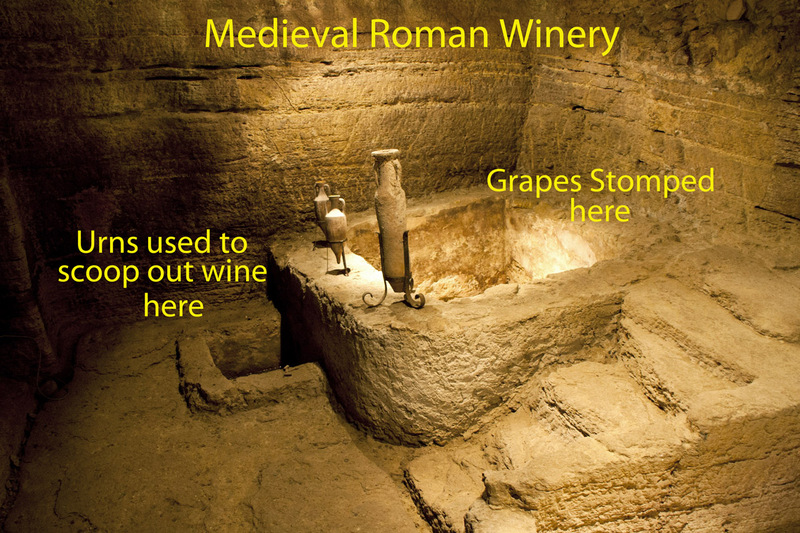 This particular cellar even had on display a preserved early Roman wine press and vat that was carved right into the stone floor. This was no doubt one of those “priceless” experiences that we all seek in our travels, and Don took the pictures to prove his good fortune! Sunsets on Batumi Beach are a majestic sight. Striated with the hues of amber and gold, an image of natural grandeur persists. At length the purpling sky gives way to darkness and the open expanse of sea mile. What are Medea and I doing in the Republic of Georgia’s premier seaside resort? Certainly not to enter a Latin dance romp. 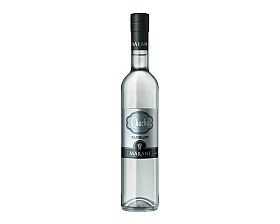 Medea delicately filled our glasses with a favorite Chacha from the distiller, Marani. “Gaumarjos!” We toasted each other. Everything about the appearance of Chacha says vodka. However, on the nose, the delightfully aromatic bouquet is of jammed red fruit and mint. On the palate there is a subtle complexity with a sweet mid-palate. The finish is a silky strawberry. Most appealing is the wonderful smoothness to this spirit that is distilled from Saperavi grapes. Medea went on to explain that after fermentation the pomace and the last fraction on the pressing wine is double steam distilled in the traditional way. At Marani, the resulting Chacha is stored in stainless steel tanks before bottling. Marani, meaning “small wine cellar,” has an interesting background. Founded in 1915, this renown winery is noted for its ability to combine the best of Georgian tradition with a modern outlook. Beginning in 1997, Marani has added state of the art techniques to enhance, rather than overwhelm Georgia’s unique wine heritage. “What is our next selection?” I queried. Mukhrani, meaning “embellished with oak trees,” is one of the most beautiful wineries in eastern Georgia. Known for their lush vineyards, Chateau Mukhrani produces some of the region’s finest examples of Chacha. Our 2007 vintage exemplified a hand-crafted and refined elegance. 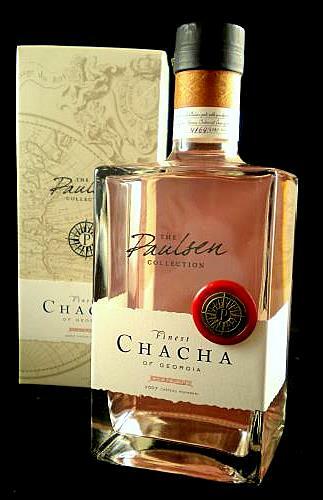 Don’t be fooled by the smoothness of this Chacha, it is very powerful. On the nose a host of wonderful jammy fruit aromas permeate the nostrils. On the palate, there is a refined complexity of flavors ranging from vanilla, licorice, and mint, ending in a long silky berry finish. Chilling does not change Chacha’s characteristics to any noticeable degree. I concluded that chilling was merely a matter of preference. Although Chacha is growing in popularity and is easily found in both the States and Western Europe, there is great news for connoisseurs and world travelers. 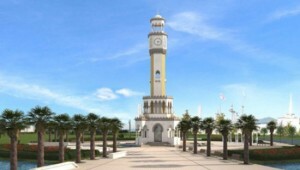 By the end of summer, Batumi Beach will host a most unique attraction. Construction is nearing conclusion of a 75 foot tall clock tower, complete with observation deck. 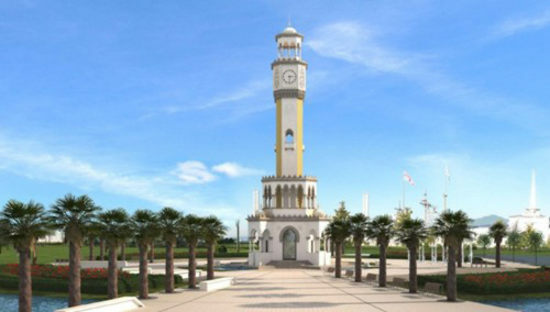 What makes this minaret styled structure so special? The lofty pinnacle will host a fountain the spurts Georgia’s national spirit. Better still, samples of Chacha will be free. The Circle of Hope (661)-254-5218; www.circleofhopeinc.org announces the rebirth of the Wine Classic!! The next Vine 2 Wine CLASSIC is scheduled for Saturday evening, August 18, inside the City of Santa Clarita’s Activities Center, 20880 Centre Pointe Parkway, from 6:30 to 10:00 p.m.
Now named the Vine 2 Wine CLASSIC, and in its eleventh year, this blockbuster of an event combines the highlights of the previous Vine 2 Wine, which had been sponsored for nine years by the Betty Ferguson Foundation, and the Santa Clarita Valley Wine Classic, which had been sponsored by College of the Canyons for twenty years, attracting more than 50 wineries and 750 people, until it was discontinued several years ago. Last year’s Vine 2 Wine CLASSIC, which features unlimited tastings of upscale wines (and of beers in the Beer Garden, as well as delicious foods) for the single price of admission, had 40 tables where more than one hundred different wines were poured, including dozens of rare, older “library” wines. It attracted a crowd of approximately 500 people and was held in the Mann Biomedical Park. This year, we are moving the event indoors and expecting a larger crowd, for an elegant evening of wines, beers, foods, live music, a raffle of expensive, rare and desirable wines, a silent auction, and much, much more. The Circle of Hope will also be featuring tastes of Vintage 1863 Madeira – grown and harvested while Abraham Lincoln was giving the Gettysburg Address. Madeira was the favorite wine during Colonial America. For further information about the Vine 2 Wine CLASSIC, including the availability of tickets, and how you can purchase a taste of that extremely rare and unforgettable 1863 Madeira (a limited number of tastes of this amazing wine will be available for donations to the Circle of Hope) simply log onto the Circle of Hope’s website, www.circleofhopeinc.org. We are just now beginning to print our advertising materials and tickets, and to add website information, so please be patient. If you are looking for sponsorship opportunities, please contact the Circle of Hope office at (661) 254-5218. The Circle of Hope provides financial assistance and counseling to local victims of breast cancer.